Starting this spring, art will bring science to life for Albany County residents as they watch biodiversity-related video and audio projections in public and outdoor spaces. 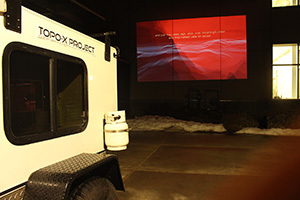 The Transitory Observation, Projection and Outreach Exploration Project, called the TOPO-X Project, features a specially designed trailer with the ability to house, protect and power research instruments, as well as video, audio and projection equipment. The project brings together visual artist Brandon Gellis, assistant professor in the University of Wyoming’s Department of Art and Art History; J.J. Shinker, associate professor in the Department of Geography; and Meg Thompson Stanton, artist and coordinator of the Laramie Public Art Coalition (LPAC). It was made possible by a UW Biodiversity in Art grant and other matching funds. The trailer arrived in the winter, and Gellis is using it to project a body of work on how climate changes affect species extinction at his exhibition, “Innate Confluences,” at the Loveland (Colo.) Museum of Art in March. “We are projecting videos that show how the landscape has changed through color,” Gellis says. For example, as a representation of a mammoth moves across Wyoming’s natural landscape, the image of the mammoth begins to dissolve at a rate proportional to its extinction in the late Pleistocene. Shinker says the rates of past environmental change are important for contextualizing and understanding current and future rates of change, and the project will provide the public with context for biodiversity shifts that occurred during the late Pleistocene. Gellis’ students also are creating work based on biodiversity themes that can be used to project around the region. LPAC will help find locations and promote events, as well as organize open-projection calls for local artists. The first Wyoming-based TOPO-X projection event is planned May 4 at UW’s Berry Biodiversity Conservation Center, followed by Vedauwoo in the summer and Truman State University in Kirksville, Mo., in the late fall. Other events are to be determined. To learn more, visit www.brandongellis.com/topoxproject.